Tidbits from the Tremaynes: Craptacular, Craptacular!! I'm in a craptacular mood, again. And I ain't afraid to show you the way I can take any ole (even the awesomest) of projects, and totally jack 'em up. I'm all about keeping it real. So, onward! I saw a sign at the beloved Hob Lob, and I thought to meself, "Self, Dad's got to have that in his workshop." It made me laugh and laugh. . . but it was like soo small. Wha? So I's all, I'm gonna make this myself. Now I like how it turned out over all; I love the crackle effect. But. . .
Can I put anything on straight?? Come on! Is there a "crooked" sickness? 'Cause I have it. I cannot hang, cut, write, draw, paste, etc., anything straight. Geez. Now, these are just like eating Tums. Am I right, or am I right? Hey Mickey, you're so fine, you're so fine you blow my mind.. . .
Anywho, I's all like: yeah, man. 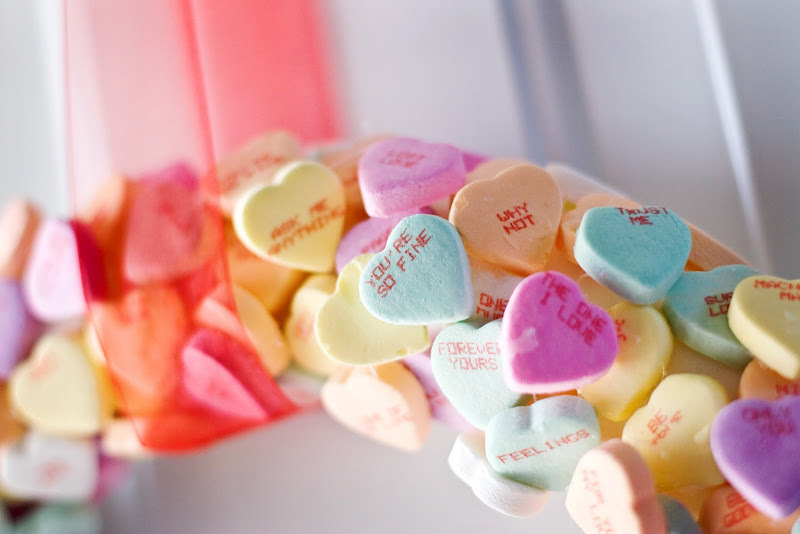 A conversation heart wreath. So I made it. And I only burned myself with hot glue like 8 or so times. That's it! But then I's all, it needs a sign and stuff. Sometimes I'm all, "Ooh me likey!" And sometimes, I'm just like, huh. Craptacular strikes again. It just depends on me mood. I've got all kinds of other interior desecrations to show you. But that's for another day, my friends. I like your wreath. I think it turned out cute. I usually burn myself more than 8 times so you did great. ha ha. LOVE the sign for Dad....crooked or not! Love the wreath though. Genius! Love that saying on the sign, I have a son who need that. Oh so cute wreath! Wonderful job. Only burned 8 times? You're goooood! I love both crafty crafts. This is AWESOME!!! So cute! I featured this at somedaycrafts.blogspot.com Grab My "featured" button. A small level...that's what I use when I need a straight line, cuz I have the crooked disease too! My dad has one with a laser...thought of stealing that once or twice. Love it...that wreath is so cute!! I don't like them hearts either. But I do like the cinnamon lips (like a cinnabear). YUM! Hey, did you get a vinyl machine or the cricut that cuts vinyl? Do you have the program that hooks to your computer to cut whatever you want? I Love the gun sign! I think it would be cute with bullet holes in it. 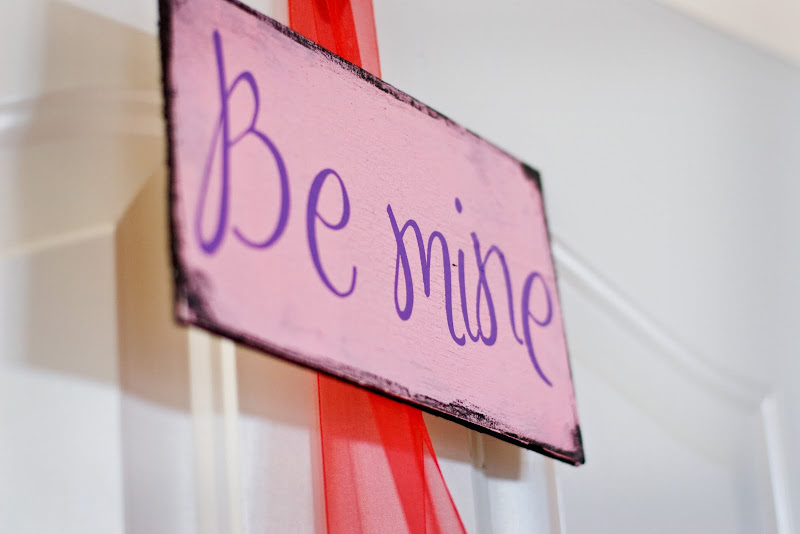 :) I Love the valentines decor too! I am going to TRY to make the fabric ribbon wreath. I will keep ya posted. 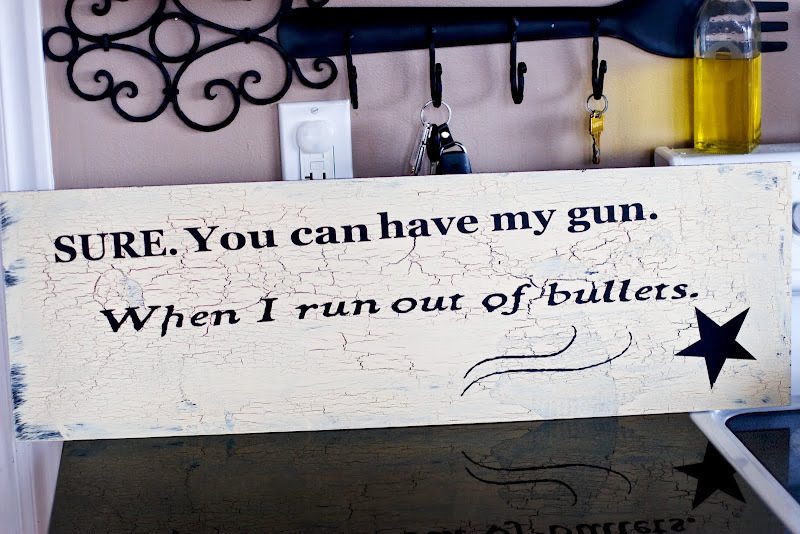 My husband desperately needs the gun sign! I'm so glad to know that I'm not the only one that can't hang ANYTHING straight! Before we even got married, my husband and I got in our first MAJOR fight over trying to hang some decorations in my apartment. I ended up using some choice explatives (which I NEVER use) and then had to apologize for a week! I love this idea and will be featuring it if that is ok with you!? 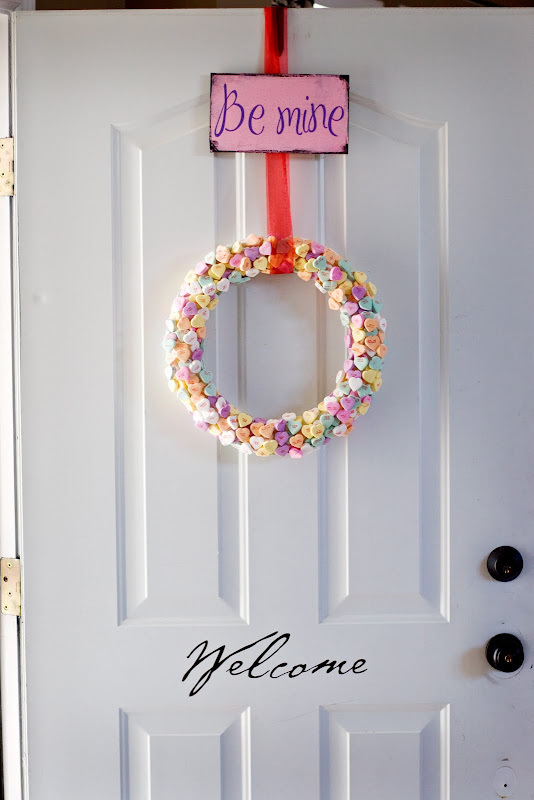 This is a really cute wreath. Please feel free to link it up with my Talented Tuesday link party at My Frugal Family! Very cute wreath! I have been using conversation hears in my decorating too, they are just a lot of fun! Your wreath turned out adorable! I'm with you, those things are nasty. This is a much better use for them! Love the wreath! Very festive and fun. Thanks for joining the party today. I've fixed the code for my partay button so swing by and grab one for your post. 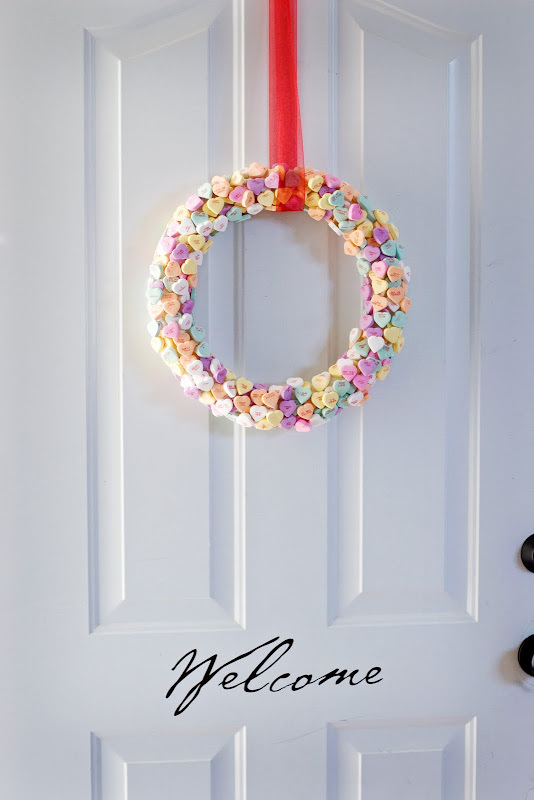 I was so inspired by your wreath I not only went out and got those hearts, I also included it on my post of Valentine's inspirations with a link back here... If you want me to remove it, just let me know. Thanks.